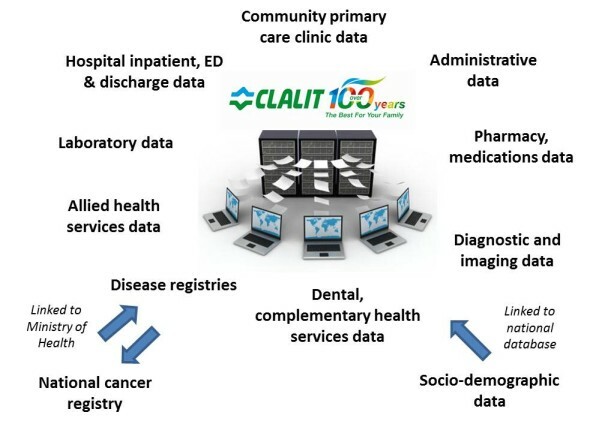 As an integrated health care provider and insurer, Clalit Health Services has a centralized database warehouse collating clinical and administrative data from the majority of medical encounters of all members. All of these data are linked through a unique identifier and geo‐coded with the patient’s clinic and home address, and aligned with area‐level statistics. The data warehouse uses a single, universally adopted EHR system throughout the entire organization. Clinical, administrative, and financial data are captured from hospitals (inpatient and emergency department settings), primary care clinics, specialty clinics, pharmacies, laboratories, diagnostic and imaging centers, allied health services, dental and complementary health services, as well as organizational and national disease registries. The data warehouse is also linked to national databases providing socio-demographic information related to patients and clinics. Additionally, we have the ability to link all medical and health care information of family members. This data is augmented by the largest ongoing patient experience survey in Israel, which is collected through Clalit’s patient portal and Personal Health Record (PHR). In accordance with ethical standards, all extraction of data and research must obtain institutional approval from two separate and independent ethics committees. Any research conducted must comply with these committee requirements and ultimately have beneficial application to the well-being of the members of Clalit. In order to uphold the privacy of Clalit members, data is analyzed in aggregate form without identifying information. All data analysis is conducted on the premises at the Clalit Research Institute and no identified or non-aggregated data leave the premises.